the official art show for the 2018 Annual Azalea Festival. Susan began her career as a high fashion illustrator for Womens Wear Daily and Glamour Magazine. 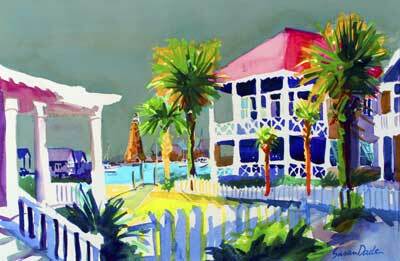 Instead of sketching models, she now paints landscapes, waterfronts and other maritime subjects. Her delightful award-winning paintings are free and loose, yet detailed. Her palette is bold, colorful and expressive. As a Watercolorist, her style is uniquely her own. Susan's paintings have been acquired by many private and corporate collectors. Susan is a Signature member of the Watercolor Society of North Carolina, Associated Artists of Southport, Wilmington Art Association and The Artisans of St.James.